Against my better judgment and contributing much to Mr. President’s angst, was the addition to this year’s waterfowl opener by my brother (Diesel). As if Duck Power Incorporated wasn’t already brimming with sarcasm, mockery and cynicism, the combined forces of the brothers grim is enough to test the patience of any mere mortal. Appearing in the middle of the night, recently off the late shift, via kayak and decked out in the latest and greatest in high-tech waterproof, duck repellent materials, Diesel arrived reeking of hunting prowess. Assisting him with his gear, I noted that approximately half the space in his small watercraft had been reserved for shotgun shells. My immediate estimate had the count at approximately three hundred rounds. Inquiring if he felt he had brought enough ammo, he replied with a hesitant, “I hope so”. Awakened before my alarm, by motivated duck hunters high on adrenaline and lustful with the promise of opening day, I struggled though prying myself from the warmth of my sleeping bag. Slowly gathering together my gear and donning my waders, I wasn’t surprised to find that I was last into the duck blind and a pot of coffee was already at full boil. Fully 4-5 hours before the first legal trigger pull, I was wondering if perhaps we had awakened to early. Slowly time slipped by. Whipping out half a box of doughnuts, a liter of sugar laced coffee and sucking on a lip full of Grizzly Wintergreen, Mr. President literally vibrated in the blind, in a display of excitement teetering on utter loss of self-control. Possessing no watch, I was able to accurately predict the hour of legal shooting, by the rapidly shaking floorboards. The sudden appearance of ducks, driven by hurricane force winds, had Diesel jumping up like a gas powered, dynamite fueled jack in the box. Three quick shots rang out, there was a quick re-load and three more were fired. This entire procedure occurred in precisely the same amount of time it would take a man with a heavy Downeast accent to say SKYBUSTING. Just as the barrage of echoing gunfire faded, ducks on the distant horizon, had an adrenaline fueled Mr. President frantically grabbing at his call lanyard. 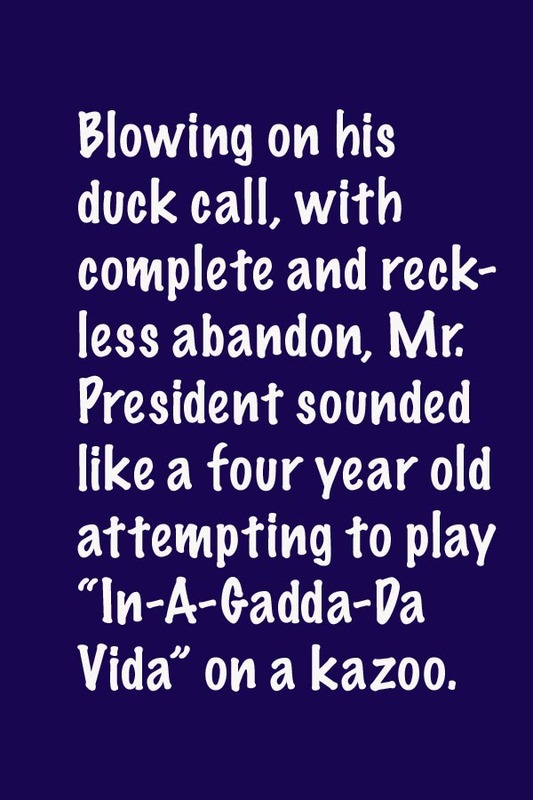 Blowing on his duck call, with complete and reckless abandon, Mr. President sounded like a four year old attempting to play “In-A-Gadda-Da-Vida” on a kazoo. After mentioning, his calling technique had a greater chance of attracting reefer-smoking hippies than mallards, Mr. President carefully placed his treasured duck call into his jacket pocket, where it resided for the remainder of the morning. Unprepared, for this onslaught of helpful support and assistance, Mr. President flashed a thousand dollar smile and extended a hand offering doughnuts and fresh brewed coffee to appease the brothers grim. Well known mountaineer Mark Twight once said, “It doesn’t have to be fun to be fun.” If I interpret correctly, what is meant by this quote, is that even when the rain is pouring down sideways, your shivering and there isn’t a single duck in sight, my bets are that most waterfowl hunters would be tucked into a marsh blind, brandishing a colossal smile. While the weather certainly challenged us, sitting together in the blind that cold morning was an experience begging for repetition and something I am sure will long be repeated, by the members of Duck Power Incorporated, until time robs us of our ability or desire. I have associates that "play" the duck call as well. I enjoys those in particular who blow at sea ducks with a mallard call. The Lord sure made some nice lookin' critters! DDH . . . “In-A-Gadda-Da-Vida” Baby! HAHAHAHAHA! IN, Mallard call for sea ducks NEVER! Ok unless we are really desperate or we are having a bad day or we are bored or we tire of making fun of DDH for sipping on a drink box, or its a Saturday . . . get the picture? We are freaking yahoos. TS, Thanks! SOOOOO glad hunting season is here. Deer hunt starts tomorrow! Awesome post and props for getting out the sleeping bag. Makes me excited for the looming duck season! Thanks for following and I'll do the same! You haven't seen anything. Check out this old video of us hunting Eiders on the Atlantic in Maine during December. Squirrel! It's Whats For Dinner!